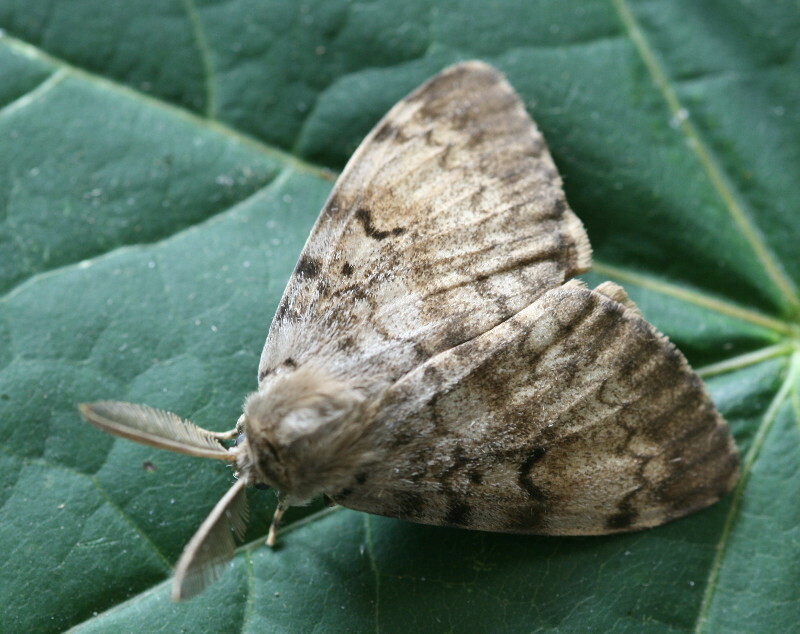 Sunday morning I walked near the Connecticut River, and the ground was dotted with soft, white, female gypsy moths who had reproduced and then fluttered downward to die. Later Tom and I walked at Machimoodus State Park and saw scores more white bodies. We watched one female who was busy producing her egg sac on a tree trunk. A brown male hovered nearby, and it was hard not to anthropomorphize, imagining him akin to a pacing, proud, and concerned new human father. This guy had up to 1000 offspring to be proud of! I remembered my writing residency at Trail Wood last August, when the female gypsy moths, dead and dying, peppered many trails. I had time to watch them and think about them, and I felt compassion for these much-maligned creatures. I understand that this year is considered an “outbreak” year, as was 2015, and that these insects can wreak some serious defoliation. I’m sure this prospect would bother me more if I was an arborist. But it does sound like nature has its own tools for keeping this prolific population in check, at least partially. 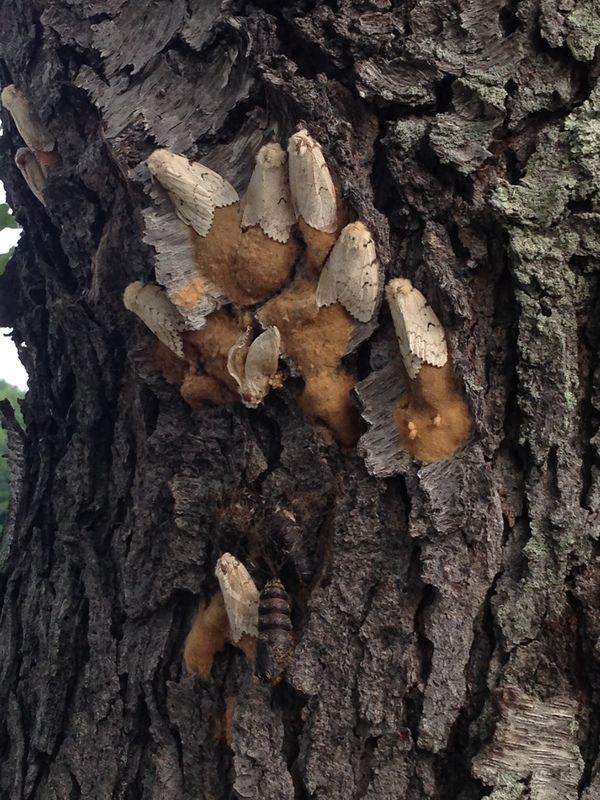 There’s a fungus that kills many of the caterpillars. And small mammals love to eat the moths! I’ve heard other nature writers say that often these overruns of nature have a way of limiting themselves. It seems unfair to me sometimes that we decide to like, or not like, creatures, based on their appearance, or sometimes on their volume. 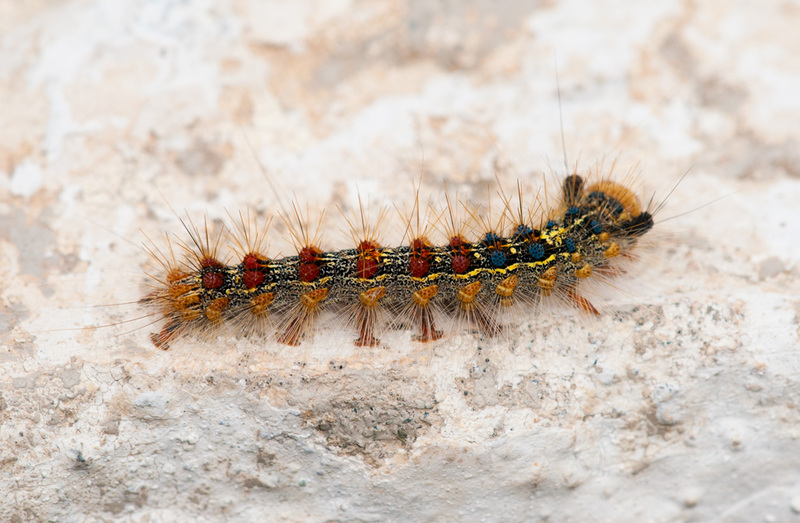 I’ve met plenty of people who are just creeped out by the hordes of gypsy moth caterpillars, and not because the creatures are consuming leaves. I even got a little spooked when I walked through a particular grove and could actually hear them chewing the green leaves, en masse (someone told me I might also have been hearing them relieve themselves, an even ickier thought). Still, I have liked the fuzzy caterpillars with their impressive spikes and jewel-colored dots since I was little. They molt 5 times, shedding their skin as they grow and finally curling up and becoming pupae (in cocoons). They only get to live as moths for 2 weeks or less, and reproduction is their final task. I admire how the egg sacs, which are coated with hair from the female’s abdomen, are sometimes moth shaped. My viewpoint may be unpopular, but I find myself rooting for those tiny lives contained in the sacs. They will overwinter within the hard cases, cozy against the bark of their nursery trees. I want these creatures to make it to their next phase of life, next spring. Many are born because only a fraction will escape predation or illness, or in the case of the caterpillar carcass-littered parking lot at my job, the frequent comings and goings of mankind. It makes me sad to see the continuing rain of white moth bodies on the ground. I don’t know what the moths think or feel, of course, but I hope they enjoyed their short lives. They have made mine more interesting. If we can forget the few times we were stung, ignore the fearful warnings of friends, we can watch wasps catching flies and small caterpillars to feed their young. We can watch as they scrape up wood fibers into pulpy balls to carry back and add to the nest. In the fall…we can cut the big bald-faced hornets’ nest out of the lilac. Slicing open its many-layered paper envelope, we will find level upon level of comb, intricate architecture built without blueprints or a foreman. Wolves howl in the boreal forests, but few of us will ever hear them. Wasps, on the other hand, still come to every picnic. Make room for them. We shouldn’t have to enjoy wilderness at a distance. A beautiful piece, Kathy — words and images that capture brief lives, lived in a world that too often understands or cares about such as these.